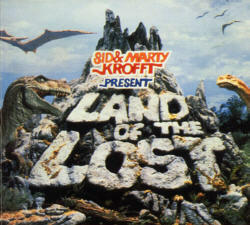 Don't ask me why, but I just had to check and see if "The Land of the Lost" was available on DVD. Lo and behold, it is. All three awful seasons of it. Cha-ka gave me the creeps. I thought Enik's name was "Eunich". (For real - even though I had no idea what a eunich was at the time.) But I liked the pylon business. That was cool. Well, cool-ish. I decided to see what - if anything - Amazon users had to say about Season Three, when the already craptacular show not only jumped the shark, but knifed the shark in the back, and then beat the shark badly with a truncheon. 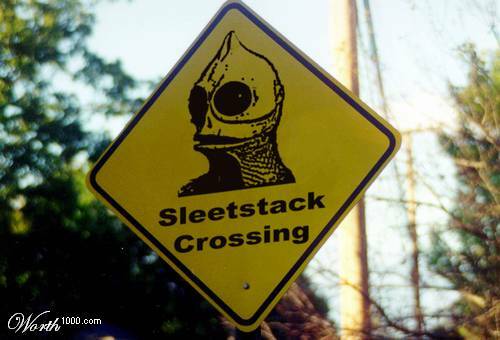 Sleetstack? Any relation to Robert Stack? I love the sign, even if the spelling is whacked. Indeed, much to my surprise, there were multiple reviews of this '70's rubbermasked horror. And, after reviewing the thoughtful musings of true fans, I have to say: thank you, Amazon users - your reviews of Season Three serve to amuse and educate. Enjoy. Want some more? I bet you do. How about a nice mp3 of the banjo-riffic theme song. C'mon - ya know ya wanna hear it!! Knock yer socks off - and remember, don't touch the pylons! ...and may you have twice the number, gunslinger. thanks for the comment on my blog. i've no idea why the main textfield was acting up for you - this the third version of my blog to be 100% flash, and the issue has never come up before. regardless, there's an lj syndication of my blog, if you're so inclined, at http://www.livejournal.com/users/indextwo/ and the raw rss feed at http://indextwo.net/indextwo.xml. so many ways to enjoy crunchy bloggy goodness.